Rolling Stones’ 40 Licks, Pink Floyd’s Dark Side of the Moon, & Wood Stock. What are you thinking about right now? If you’re like me, each one of these albums or events puts amazing thoughts, ideas, and maybe even memories (if you’re old enough) into your head. Now, imagine for a moment taking all you’re memories and thoughts and bottling it up for consumption. Seem ridiculous? Don’t tell that to wine maker Mark Beaman. Inspired by these very events, wine maker and die hard music fan Mark Beaman has done just that. He along with Mendocino Wine Company have collaborated to bring you “Wines That Rock” – “Great tasting wines inspire by music”. 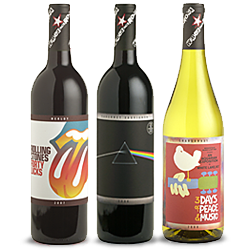 Forty Licks Merlot, Dark Side of The Moon Cabernet, and Woodstock Chardonnay are Beamans first attempts at capturing the essence of an album. Though they mentioned that they didn’t want to just “slap some cool labels on a bottle”, their marketing department most certainly did their part. I would be lying if I didn’t say that when these bottles caught my eye, I didn’t immediately start hearing music in my head. But lets face it, when it comes down to wine making, a great name and a fancy label can only get you so far. How exactly do they taste? Having had the pleasure of tasting these let me say that they are not merely novelty acts but actually hold their own against similarly priced wines in their categories. Wood Stock Tasting Notes: The 2008 Woodstock Chardonnay opens with an enjoyably eclectic mixture of rich pear, mineral and papaya aromas followed by fresh flavors of Asian pear apple, citrus, and tropical fruit with great acid on the finish—or, as Mark likes to say, “sunshine in a bottle.” Enjoy this rich dry white wine with salmon, chicken, creamy soups, and white-sauced pasta. 40 Licks Tasting Notes: The 2007 Merlot captures the attitude of Mendocino County’s style. Aromas of black cherry, with hints of mint are followed by rich flavors of plum, black cherry, brown sugar, cinnamon, and cedar. This dry red wine is a fine match for herb-roasted chicken, grilled beef or smoky chili. Dark Side of The Moon Tasting Notes: The 2006 Cabernet Sauvignon captures the attitude of Mendocino County’s style. Aromas of black currant and cherry are followed by rich flavors of cassis, toasted vanilla bean, and hints of chocolate. Enjoy this rich dry red wine with hearty chicken dishes, beef and lamb, and red sauced pasta. You can find these wines all reasonably priced ( at around $15) at your local wine and spirits retailer. If there isn’t distribution in your area, feel free to visit their website. Become a Fan on Facebook ! Take The Oak Heart Challenge: Bacardi Oak Heart launches across U.S.